Kingfisher East Bengal will need to pull all their resources together as they bid to continue their winning run against Churchill Brothers FC Goa in the round-thirteen Hero I-League game at the Barasat Stadium on Tuesday (March 7, 2017). Since Derrick Pereira’s appointment as Churchill coach, the former champions have picked their game up winning against mighty Mohun Bagan at home, that too rallying from a goal down. The Red and Golds are also buoyed after their away win against Shillong Lajong FC. Australian forward Chris Payne struck a first-half double to seal a 2-1 win in Shillong and it took the Trevor Morgan-coached side to 27 points from 12 outings, one point clear of Aizawl FC. Willis Plaza, who has netted six times so far, also returns from injury for the home side and they know all too well Churchill are a different side and will come hard at them. Wedson Anselme is yet to regain full fitness and is likely to sit out. 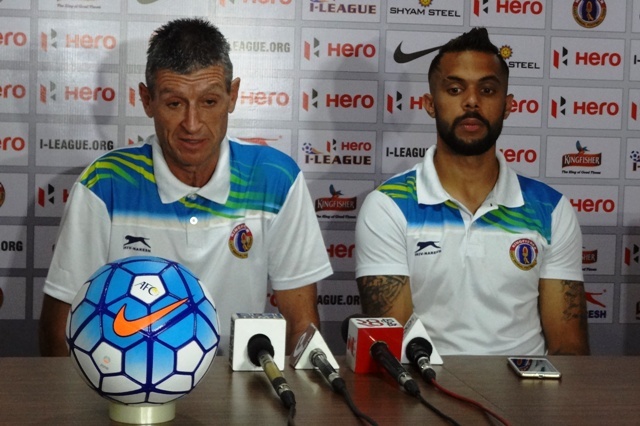 “Churchill will be a tough fixture and we have to be at our best to win the tie,” Morgan said after reaching Kolkata from Shillong. The Red & Golds had blanked the Red Machines 2-0 in their away fixture in Goa on January 18 and they will be aiming for a double for the first time since 2004-05. “We’ve managed to get two wins from two away games, we’ve got a home game coming up now which we need to win. We have one more game then we have the break. The break will give everybody the chance to give the players some time off. Everyone gets the chance to recharge their batteries but we have to keep ourselves in the mix so when we come back with a few games to go, we’re ready,” Morgan added. “It’s a very good win for us. The players worked very hard to get these three points. There were a few moments where we lost focus in defense when we conceded the goal. Sony Norde was left free and we conceded from that,” Pereira, former Salgaocar and Pune FC coach had said after their last game. The match is slated to kick-off at 04:30 PM and it’ll be telecast live on Ten 2.